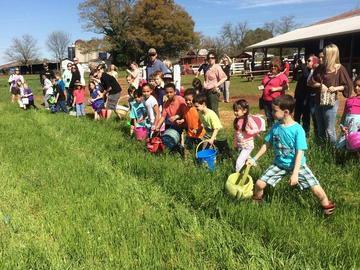 You and your family are invited to our Annual Easter Egg Hunt at Denver Downs Farm, on Saturday, April 20, 2019. Church Groups are welcome! Children up to age 12 are invited to hunt eggs. Each child collects 12 eggs (filled with candy). Prize eggs turned in for prizes at designated table. Bring your own basket. Hunt areas are divided by age groups (Toddler area, Ages 2-5, Ages 6-12). This is in our 100 acre field- so plenty of room to hunt eggs and have fun! After hunting for Easter Eggs, all are invited to see the newborn baby animals, have their photo with the Easter Bunny and Friends, play games, jump on giant jumping pillow, ride the cow train, have face painted, plant a flower, and jump on the giant "eggs". Hunt sessions will be held at 10:30am, 11:30am, 12:30pm and 1:30pm. Select time you prefer, purchase that ticket, and please arrive 15-30 minutes before the hunt you select. Families that have children in different age groups may hunt together in either of the areas. Gate opens at 10am and event is complete at 2pm. Fee added to online ticket sale includes SC admissions tax. No age limit for the Special Needs Hunt. Under age 2 is no charge. There is a Toddler Area for picking up eggs (unfilled plastic eggs). Easter Bonnet Contest at noon on the main stage...Have fun creating a beautiful Easter Bonnet and wear to the farm! Prizes for Adult and Children Categories! Concessions and Hot Dog Lunch Plates available. Easter Cookie "Decorating Station" included with lunch. Rain date is Saturday, April 27th. Refunds not available for this event. Look forward to having you with us at the farm! Hoppy Easter!